Updated 8/5/14: Show note formatting cleaned up. Also, typo in notes: kids most commonly get objects loved in the esophagus at the level of C6 (cricopharyngeus mm). Typo incorrectly said T6. 1. Please go join our Google Community. The goal is to have this be a place that EM residents and educators (you can help answer resident questions) can get together to discuss resident issues and questions, both clinical and non-clinical. Other blogs (See EMCrit and R.E.B.E.L EM) have had nice success with this, as it gives you a chance to discuss in a bit more of a long form than twitter, is more fun than a listserv, and provides a central location for discussion. 2. I am going to be offering quizzes at the end of each podcast I do. After answering the short questions in the quizzes, you can print out a certificate that says you spent time listening to the podcast and doing the quiz. My hope is, that with approval from your individual US EM Residency program directors, you can count this toward individual interactive instruction time (also known as asynchronous learning) if you are in a US EM residency program. As stated, make sure your program director approves of this before you go chalking this up as asynchronous time. As usual, Academic life in Emergency Medicine has led the way with this (check it out here), and I hope this is something that catches on with other blogs and podcasts. Check out the podcast below, the show notes that follow, and if you can get credit, the quiz is at the bottom of the page! Removal, or let it pass? 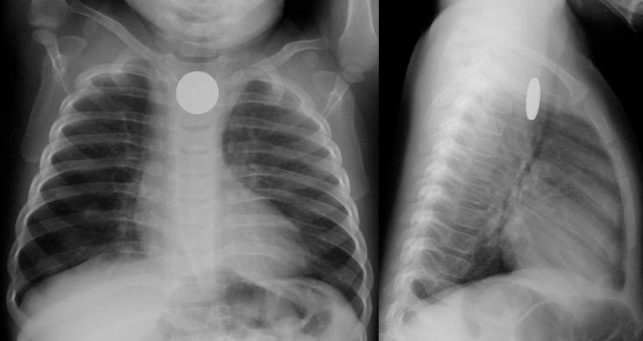 The classic appearance of a coin in the esophagus. A tracheal going would have the opposite appearance on each image. And what did you eat again, sir? Brent, J et. al. Critical Care Toxicology. 2005. Elsivier Mosby. Up To Date: Caustic Esophageal Injury in Adults, updated 9/11/13. Contini, S. and Scarpignato, C. Caustic injury of the upper gastrointestinal tract: A comprehensive review. World J. Gatroenterol. 2013 July 7; 19(25): 3918-3930. Abaskharoun, R et. al. Nonsurgical management of severe esophageal and gastric injury following alkali ingestion. Can J Gastroeneterol. 2007 November 11; 21(11): 757-760. Up To Date: Foreign bodies of the esophagus and gastrointestinal tract in children, updated 12/30/13. Albertson, TE et. al. Gastrointestinal decontamination in the acutely poisoned patient. Int J of Emergency Medicine. 2011, 4(65). Talk to your program director and if they approve, take the test below to help you count this podcast and blog post towards asynchronous learning!